Pianist Patti Bown was a childhood friend and musical partner of the great Quincy Jones, a longtime member of Gene Ammons’ band and the composer of a minor jazz classic. Yet more often than not, writers and even venerable jazz anthologists can’t even spell her name right. I can’t tell you how many times she is listed as Patti Brown, by those who are apparently slaves to their spell check. Patti Bown [pronounced “bone”] was born in Seattle in 1931, one of seven children. She was raised in a home that was filled with music and the arts. She stunned her family at three by sitting down at the family piano and playing a Duke Ellington tune that she had just heard on the radio. Her sister, Edith Mary Valentine, became a classical concert pianist. Patti however, went in a different direction; playing jazz. One of her childhood playmates also loved that music: Quincy Delight Jones (reportedly, they used to play “house” together as kids). Ms. Bown learned how to accompany a soloist from another pianist friend of “Q”; Ray Charles. Her musical skills won Patti a scholarship to Seattle University, then to University of Washington and finally to the Big Apple, which became her home for the rest of her life. Patti quickly earned a rep as a good sight-reader and improviser, which made in great demand in the studio. In 1958, she recorded her only album, a trio date for Columbia: Patti Bown plays Big Piano; with Ellingtonian Joe Benjamin on bass and Ed Shaughnessy (who would soon achieve fame on Johnny Carson’s Tonight Show) as the drummer. To these ears, Ms. Bown was an excellent technical pianist, rooted in bop but with a strong dose of gospel-soul in her left hand. For comparison, think Bobby Timmons or the pre-fusion Ramsey Lewis. Perhaps her similarity in style to those gentlemen, who were her contemporaries, contributed to her dearth of recordings as a leader. However, Ms. Bown was still very busy. The next year, old playmate Quincy called her for his 1959-60 European tour and for his classic album The Quintessence. She also did some writing, as Q added her soulful shuffle “G’won Train” to his book. It became a Jones staple and it can be heard on several of his recordings of that era. Other artists also dug “G’won Train” too, especially Jimmy Smith, who recorded a hard swinging version of it on Any Number Can Win. It was a minor chart hit for J.O.S. [UMG would not permit me to embed a clip of this track in my post. Click here to view/hear it on YouTube]. She also found regular work with Gene Ammons, Oliver Nelson and Cal Tjader during this period. Patti Bown, remember her name…and make sure that you spell it correctly! 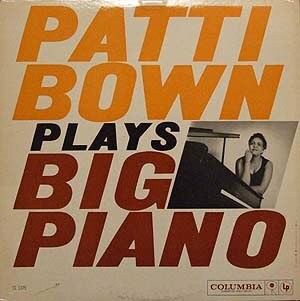 Patti Bown Plays Big Piano (Columbia) – [LP only] OOP. But it can be had for a reasonable price if you search online or at larger used record shops.